Spring is here and with it has come hot weather the past couple of weeks. The greens at Scotsdale have come out of the winter and are looking and doing great. 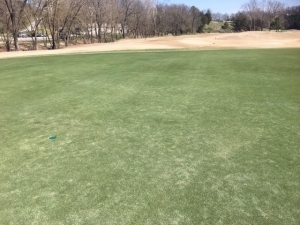 Ground temperatures have started to come up and we are starting to see all the Bermuda beginning to change. As we go into the season we will be working on greens to help improve the ball roll and smoothness. This will increase sand topdressing utilized with vertical mowing to help keep thatch levels down. If we didn’t do this the turf would get spongy and would be more prone to problems such as diseases and insects. With our greens being Bermuda, our aerfication dates are in the summer. This is because when this grass is growing more aggressively and healing time will be shorter. Due to being a no till grow in, we will be doing 3 core aerfications this season to help make the profile more uniform and to relieve layering that has occurred. This will help improve soil air and water capacities to a more beneficial level improving root growth and overall plant health. These will be done late May, July and August. 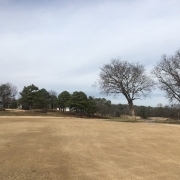 Below is a picture of a green and how they have made the transition out of dormancy. Thank you for the support and understanding with our work. Looking forward to a terrific 2019 golf season here at Scotsdale. The POA’s Golf Maintenance Department will aerate greens beginning April 16 on Berksdale. Kingswood and Dogwood courses will also be completed during the week of April 15 – April 20. Details regarding the aeration were provided by Keith Ihms, Director of Golf Maintenance. By core aerating greens, water and air movement are allowed throughout the greens profile. Aerating the greens will promote the overall health of the courses’ turf, aeration also works toward removing thatch and building stronger root systems. The main purpose of pulling cores is to manage the thatch layer on the greens. The thatch layer is mostly made up of dying and un-decomposed leaf and grass material. By pulling cores we are removing some of that material and preventing it from building up to an unacceptable level. Thatch causes the greens to become soft and spongy, which can make for poor putting conditions. When thatch gets to this point it also can become a problem dealing with the other issues it causes, such as fungus growth, mower scalping and “localized dry spots,” which will not absorb and retain moisture. Aerating creates openings in the surface for water and nutrients to be absorbed. As well as the sand that will be used to smooth the putting surface, fill in voids and amend the green profile. A second sand topdressing will be necessary a week or so after aeration to complete filling of the aeration holes and smooth the surface. April 15 – Berksdale Golf Course will be closed for aeration. April 16 – Berksdale Golf Course will be closed until 11 a.m. for maintenance. 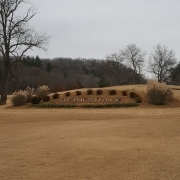 April 16 – Dogwood Golf Course will be closed for aeration. 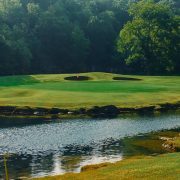 April 17 – Dogwood Golf Course will be closed until 11 a.m. for maintenance. April 17 – Kingswood Golf Course will be closed for aeration. April 18 – Kingswood Golf Course will be closed until 11 a.m. for maintenance. The Bermuda greens at Scotsdale are scheduled to be aerated May 28 & 29, July 8 & 9 and August 5 & 6. Brittany is scheduled for July 15 & 16. Spring is approaching, and it couldn’t come soon enough. After starting the month with temperatures as low as 8 degrees, the days are starting to feel closer to average temperatures again. 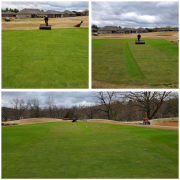 We were prepared for cold weather as we had installed both sets of covers on the greens. I know it causes a disruption with playing this great course, but it made a huge difference and protected the greens very well. Now we are starting to see soil temperatures rise and soon everything will start blooming. While temperatures are starting to trend up and the days are getting warmer, we will still have to be diligent about covering. Even through the cold temperatures we just experienced, the covers have helped, and the plant is beginning to green up in the lower stems and crowns. When the Bermuda greens start greening up on top more and more, it is vital we protect them from a late spring freeze or hard frost. This means if the forecast is trending colder for a couple days with lows at 30 degrees or below, we would need to cover the greens to protect them. 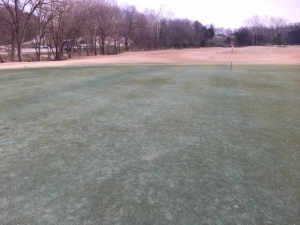 This is different from winter covering, due to the plants starting to break dormancy and more live tissue is coming up on top versus in winter, when you have a layer of dormant turf that provides some protection, especially from frost. With growing leaf blades on top, a freeze can do significant damage. At freezing and below freezing temperatures, the cells inside the leaf blade could freeze and rupture causing a big delay in complete green up and significant damage to the plant. With the plants still being young, we want to do anything and everything to assure a great playing surface for the summer. While I would absolutely love to say we are done covering and can put them away in storage, I can’t. It’s better to be safe than sorry. We will do everything we can to protect them. Hopefully weather will be good to us and we can keep the greens uncovered so everyone can enjoy playing the course. I thank everybody for their patience and I hope this helps with understanding why we do some of the things we do at different times of the year. Bella Vista POA’s Golf Maintenance crews will begin drill and fill aeration in March on Bella Vista Country Club and Highlands courses. The machine enables crews to drill a 10-inch deep hole and simultaneously back fill with sand. The advantage to this process is that, with time, the green will begin to develop the capability to move water through the profile. The process will help increase oxygen in the root zone and eventually create healthier green surfaces. 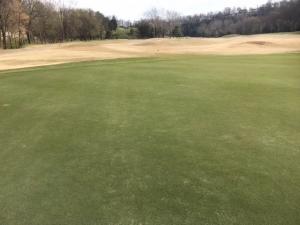 “This is only part of our management plan, along with continued use of conventional aeration to improve the green surfaces on these two golf courses,” Golf Maintenance Manager Keith Ihms, CGCS said. The greens will be playable after the drill and fill process; however, as with any type of aeration, it will take time to fully recover. For this reason, we have scheduled the drill and fill project several weeks prior to our convention aeration on the other courses, scheduled to begin at Berksdale the 15th of April. This will ensure a minimum of 3 courses available for play that are not impacted by either aeration program. The groundhog predicted an early spring but the weather is being true Arkansas weather with warm days followed by very cold days. We have been doing our best to open up the greens for play as much as we can, but it looks like the beginning of March is bringing winter back and we will have to cover for it. 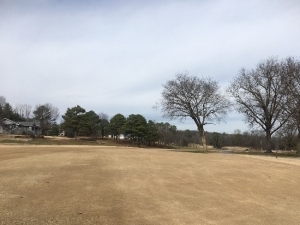 As we move into spring and the greens begin to transition out of dormancy, we will have to be extra careful with when we cover. Once they begin actively growing, late spring frost can do damage if not properly prepared. That means when temperature gets below 32 degrees and a heavy frost is expected, we will have to cover for it even if the day temps around it are good. This is a critical time for the plant and not covering for a heavy frost could set the turf back and delay complete green-up even longer. This is also the time of year we begin our weed control processes. We are currently putting out a post-emergent herbicide to control any late season winter weeds along with our pre-emergent herbicide that will control weeds into the spring and summer. This helps us to control our weed population more efficiently and keep the turf cleaner looking. By keeping weeds under control, we give the Bermuda a better opportunity to grow healthier and provide a better playing surface. At Scotsdale with our Bermuda greens, we have the advantage of being able to control weeds around and on greens better with select herbicides. This is a common practice used with Bermuda greens. 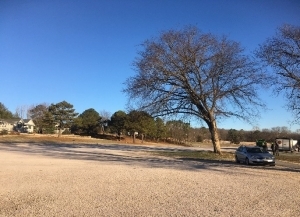 Besides all the covering and uncovering and back again, we have continued to limb up trees and remove dead branches to improve overall appearance and play ability. Things are looking good and we are excited for everyone to enjoy the course this season. 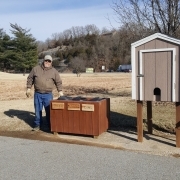 Recycling stations have been placed at Berksdale’s halfway house and #8 Tee Box. These were built with re-purposed pallets and accumulated scrap lumber. Casual observation has indicated 90% of waste collected on the course are aluminum cans and plastic drink bottles. We successfully began collecting cans a few years ago, using a large blue receptacle at the halfway house. 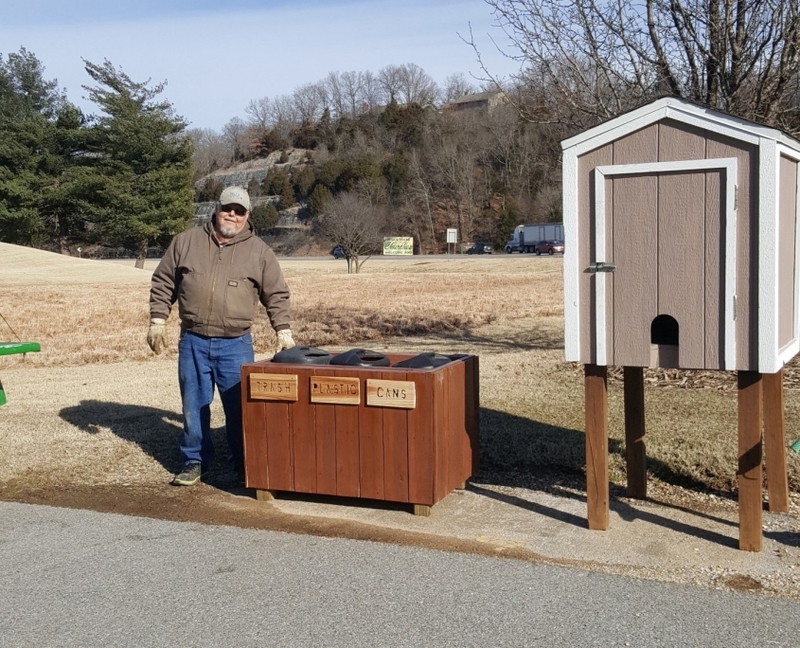 We also began recycling cardboard at the maintenance shop in cooperation with the Bella Vista Recycling Center last year. Our hope is that these stations will help further reduce our waste stream and support Berksdale’s mission of environmental responsibility. For more information, see bellavistarecycling.org, auduboninternational.org, or contact wendyb@bvvpoa.com. Winter is definitely here and sticking around. We have been fortunate with weather so far this season that while we have still had to cover, they were not on for too long of a period. We are about a week into it now and the forecast shows we will have a week left. Hopefully this will change, but we are prepared for it. While the new covers have been extremely helpful and proven much better, this time we did install both sets when we put them on. We used the old ones first and then covered them with the darker, thicker set. This will help hold in more favorable temperature and prevent the wind from hammering over the top. In preparation before covering, there were some things we did to help aid the covers. First, we took moisture readings over the greens to tell us how they are holding. Then, we applied a wetting agent that helps the sand profile hold onto the moisture without being overly wet. Next, we took soil moisture readings again over areas where we know the greens tend to dry out. We followed this with hand watering select spots as needed. Keeping moisture in the crown/root-zone area also helps hold more heat for the plant since the temperature will drop faster in a dried out profile. Luckily this time we also got about a half inch of rain the night before covering so our readings were perfect and where we like to see the moisture levels before covering. Last, we put the covers on. We did this while it was still warm to help trap more heat inside the soil profile. Doing both covers took a little longer than normal, but we were also very diligent about securing them since high winds were expected and that can cause problems if not staked down accordingly. We’ve had good success so far and will continue to do everything we can to aid the turf through the winter. While the covers are on we’ve been busy. We have taken out dead trees that were not only unsightly but also could have posed a hazard as time passes. We also had a company come out and trim up the tree on #10 fairway. That tree helps make the hole but due to the growth it was starting to become too much of a hazard. The limbs were starting to get into the fairway too much blocking what should be a good tee shot leading into the second. We’ve trimmed it back so the hole is more playable. The canopy was also raised and thinned to improve the health of the tree and the turf underneath by allowing more sunlight through. This also took quite a bit of weight off the tree helping to prevent high wind damage in the future. Hopefully the weather will soon change, and everyone can come enjoy Scotsdale again. I thank everyone for their patience and understanding the winter practices we do for the golf course.